Why so little love for Group Initiative? Among the many great things of Basic D&D, one that stands out the most for me is the initiative system. I find it so much better than the commonly used by other editions and even most B/X clones. A wonderful thing about group initiative is that it completely removes the whole work of remembering the initiative order. I absolutely hate it to scribble down a list of all the PCs and enemies in the correct order at the beginning of each fight. That’s always a minute or so of interruption doing something tedious, right at the most exciting moment of the game. The alternative is to write down the names in advance and make a row of numbers with the initiative counts, but then you easily skip someone by accident all the time. (At least I do.) With group initiative that doesn’t matter. You roll two d6 at the beginning of each round and then everyone goes in whatever order they want. But I think something even much more important is happening on the player side. Everyone is paying attention all the time and taking turns much faster. Nobody is sitting around three numbers until their number comes up. The players who decide the fastest what they want to do go first, and those who take longer do their thinking while everyone else is taking their turn. And everyone needs to pay attention during the whole enemy turn, because the next turn is always their turn. I’ve been using this system for a while, and it’s just so much more fun to run the game, and I believe for the players as well. Why doesn’t everyone use it and most games go with individual initiative counts instead? Even such otherwise great games as Basic Fantasy and Lamentations of the Flame Princess and wonderful ones like Spears of the Dawn and Barbarians of Lemuria (not a B/X clone, but still) go with the cumbersome initiative count system. Which to me really has always been one of the most annoying thing about running games. Author YoraPosted on 17/06/2015 11/08/2015 Categories game design, gamemastering, rpgsTags Barbarians of Lemuria, Dungeons & Dragons, Lamentations of the Flame Princess, OSR, Spears of the Dawn4 Comments on Why so little love for Group Initiative? The Moatia are a race of short old men with yellow skin who walk with a limping gait. All of them are powerful sorcerers who live alone deep within the forests and warn away any intruders with markposts made from bones. They are often wicked and cruel, but are also very skilled healers who have medicine and powders to cure any ailment in existance. They never provide services for free though, and the prices they demand can be very steep or appaling. Moatia don’t use any weapons or attack with their hands, but fight entirely with their magic. They remind me quite a lot of central European witches in their behavior and role. The Night Men are a race of humans from outside the Three Lands, but all of them are savage and deformed, but almost nothing is known about them other than that they sometimes cross the river at night and raid villages on the southern border. When they attack, they always do so in large hordes, and are usually led by a very powerful sorcerer or shaman. 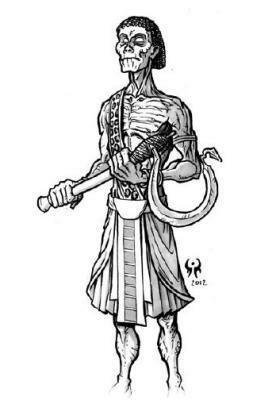 These raiders destroy villages and take large numbers of captives, which they take back to their jungles to be sacrificed in ancient ruined temples. Some people think that they are evil spirits or actually animals that have been transformed into human-like shapes. The Obia is a spirit in the shape of a large leopard or jackal that serves sorcerers and witches as a guardian or to abduct people and bring them to them. Either to become their wives or for other unspeakable purposes. An obia can grasp a victims in its mouth without hurting them and then run off into the night at very great speed leaving barely any traces. Only the greatest hunters have any chance of tracking them down and find the place where the victims are held. Defeating the sorcerer and his obia guardian is a whole different story altogether. Fantasy Safari: Spears of the Dawn, Part 1. 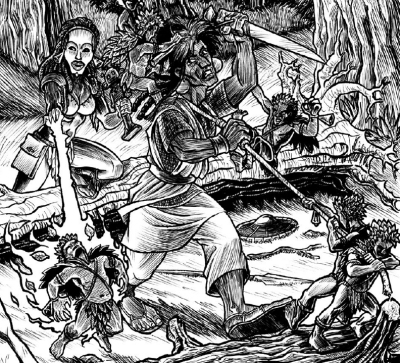 I reviewed Spears of the Dawn a few weeks ago, and it’s a nice little setting I recommend to anyone with interest in non-European influenced fantasy campaigns. I also really love the new classes and magic system based on Basic D&D that work much better for spellcasters in a Sword & Sorcery setting than standard clerics and wizards. But in addition to all that, Spears of the Dawn also has a short and very nice collection of monsters, which made me want to make another Fantasy Safari post. As part of the funding campaign, all the art from the book was given away freely, which is always very nice when doing this series. 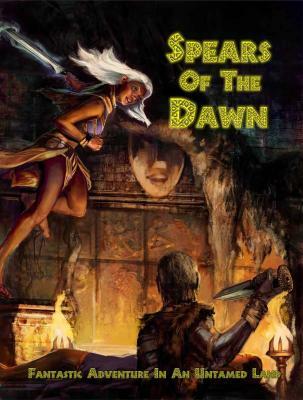 Spears of the Dawn by Sine Nomine Publishing, 2013; 11 pages of monsters. Eloko are a race of tiny people who look just like humans but have grass instead of hair and wear clothes made from leafs. However, there is nothing endearing about these little guys, as they like to eat humans. Lone hunters are a welcome meal for groups of eloko, but they have a particular taste for the flesh of women. Before they reveal themselves to their prey, they make their presence known by the ringing of tiny bells, which have the ability to cloud the thoughts of any human to the point where they will simply stand around motionless while being devoured alive. If someone can resist the mind numbning ringing of their small bells, eloko are still much more dangerous than their small size makes them look and a single one fights about as well as a fully grown crocodile. In groups they can be a real threat to small parties of adventurers. Author YoraPosted on 27/05/2015 11/08/2015 Categories creatures, rpgsTags fantasy safari, OSR, Spears of the DawnLeave a comment on Fantasy Safari: Spears of the Dawn, Part 1. Spears of the Dawn is another small sandbox setting by Kevin Crawford, who also did the excelent Red Tide setting. While Red Tide uses a great number of elements from Chinese and Japanese culture, Spears of the Dawn is strongly based on various cultures of West Aftica. The book consists of roughly three parts: A complete roleplaying game, the Spears of the Dawn campaign setting, and advice on running sandbox games. These are not clearly divided into three section though, and it’s probably best to read the whole thing even if one only intends to use certain elements of it. It’s made clear in the introduction that this book is meant to be mined for ideas and its elements disassembled and repurposed as any GM sees fit. Like Red Tide, it is more of an example of how a great sandbox setting can look like and how you make one. The setting presented in Spears of the Dawn are the Three Lands. Two centuries ago the empire of the Nyala was close to conquering all of the other five kingdoms of the Three Lands and when the king of Deshur was forced to retreat with his remaining army into the desert he discovered the means to make himself and his followers into Eternals. The Eternals are powerful undead who neither age, nor need to eat or drink, but maintain their youth and heal any wounds through the eating of human flesh. For over a hundred years the Eternal invaded the lands of the Five Kingdoms and causing the empire to fall apart. Eventually the emperor of Nyala accepted that the other four kingdoms were no longer under his control and instead created an alliance of equals to destroy the Eternals and put an end to the terror of the Sixth Kingdom. The Five Kingdoms where victorious and the Sixth Kingdom no more, but they were unable to destroy all of the Eternals as some of them escaped into the wilderness and continue to exist in hiding to this day. In the fourty years that have passed since then, the fate of the new Five Kingdoms has remained uncertain. There is peace now, but the former subjects of the Nyala still have resentments against their former masters and there are still many bands of raiders and new settlements created by refugees from the war are not always getting along well with their neighbours. The last emperor had anticipated that some of the Eternals might escape from the armies of the Five Kingdoms and created a group of warriors, shamans, and sorcerers called the Spears of the Dawn, who were given the duty to hunt down the remaining Eternals and destroy any lingering trace of their evil. 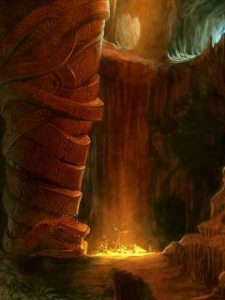 With the empire being no more and Nyala being only one kingdom among others, the Spears of the Dawn lack any real leadership or organization. However, with the threat of the Eternal and other evils still around, there are always more people who take up arms and wander the Five Kingdoms to destroy them. With many elders still remembering the terror of the Eternals well, these warriors against evil are highly respected and stand somewhat outside of the normal tribal politics and regular social classes.